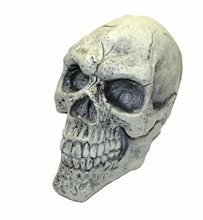 Skull Trim Horizontal;Horizontal Skull Trim - As if straight from a crypt or an Indiana Jones Movie, Makes a great Halloween decoration Comes with a realistic look. 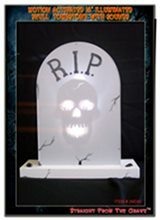 our scary Vertical Skull Trim will make the surrounding area more spooky. 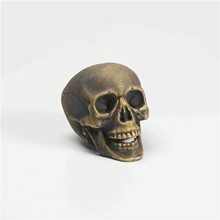 Skull Trim Vertical;Vertical Skull Trim - As if straight from a crypt or an Indiana Jones Movie, Makes a great Halloween decoration Comes with a realistic look. 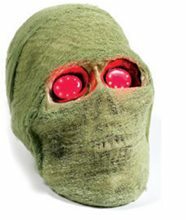 our scary Vertical Skull Trim will make the surrounding area more spooky. 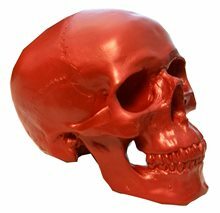 Skull Prop; Great Halloween human skull decoration Approximate Size: 4.25in x6.5in x5.25in. 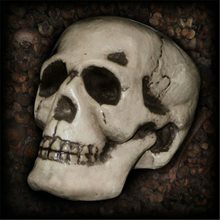 Realistic Skull,A realistic skull is a perfect add-on for any Halloween party or for decoration all year round. 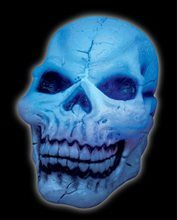 Glow in The Dark Full Skull Head 9.5"
Hanging Rotten Skull Wind Chime;A trio of hanging skulls that will clang together creepily outside your door. Measures approximately 24 inches long.